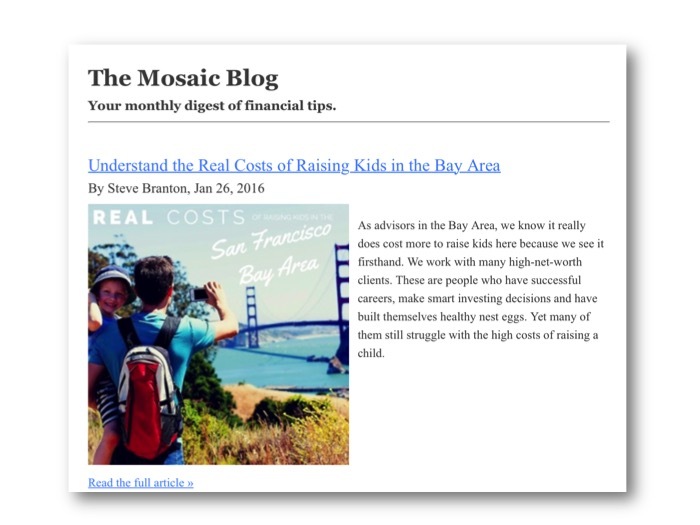 Description: The lead nurturing process at Mosaic was broken. There were a dozen form letters that were approved for sending to prospects and an internal task system that few knew how to implement. Batch emails were sent using the CRM resulting in high email bounce rates, no ability to capture data about engagement, and placing the firm in danger of having its domain blacklisted by spam filters. I reviewed available tools and implemented Constant Contact, and then later on switched to Hubspot for email automation. Deliverables: Developed project workflows and wrote and edited emails for recurring scenarios including event announcements, prospect nurturing and newsletter subscriber campaigns.